Sometimes an accusation is all that’s required. Placed under investigation on Wednesday (25 May) for lying under oath to the Saxon state parliament, for Frauke Petry’s critics, the allegation could not have been more apt. Suspected of covering up loans made to her Alternative für Deutschland party, the right-wing politician could face up to five years in prison for perjury. Joel Schalit is News Editor of euractiv.com. This article is excerpted from his forthcoming collection, Everywhere But There: Essays on Europe’s Diversity Crisis. His most recent book is Israel vs. Utopia. Why isn’t this surprising? Because racism itself is, in essence, a lie. It tells stories, which deliberately misrepresent who minorities are, and what they do in society. In this case, Muslims, primarily from Arab countries, and the Balkans. 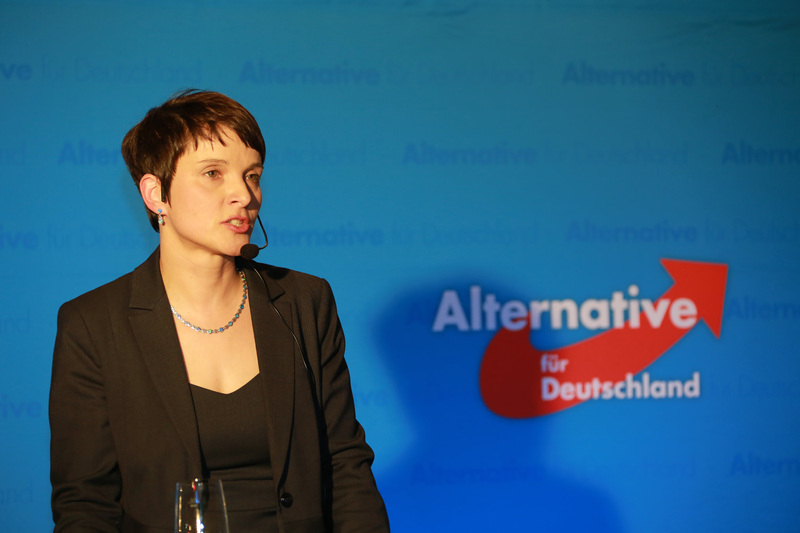 Accusing them of everything from wanting to imposing Sharia law in Germany, to contending that their religion is ‘foreign’, Petry’s platform is based on promoting falsehoods about non-white Germans. Hence, the irony of the charges leveled against her. Together with AfD colleague Carsten Huetter, the populist political leader is said to have provided conflicting accounts about donations that the party required its candidates to make to Alternative für Deutschland before regional elections in 2014. In a classic example of partisan politics, the allegations were made by André Schollbach, a left-wing Die Linke politician, as part of a report on Petry. Predictably, Petry and her second-in-command, Alexander Gauland, said the accusation was nothing more than that, and the AfD leader would survive the crisis. A cunning and sophisticated political operator, it is not unreasonable to surmise that Petry might very well walk free. However, its plausibility will not go unnoticed, particularly on the left, and among Muslim communities, for whom she has become a Faust-like figure. The subtext is clear. This is just another example of an allegedly corrupt, right-wing politician being exposed for scapegoating weaker elements in society. If they were so naturally inclined to make false claims about minorities, why wouldn’t they lie to the government about party finances? As discrimination is more a means to an end than anything else, it should never be taken at face value anyway. Neither should party disclosures about finances, obviously. The fact that the German left has to resort to such legalistic tactics, to halt Alternative für Deutschland’s advance across the country’s legislatures, is of course depressing. With legislators elected to half of Germany’s 16 state assemblies in March, the xenophobic party shows every indication of becoming a permanent part of German politics. Putting Petry in prison might very well hurt her party, but it won’t necessarily have an effect on the growing popularity of her racist ideology. What would be the trick? Unfortunately, living in close proximity to Muslims has not eroded German fears of Muslims as neighbours. Having lived with a Turkish community since the 1960s, and a growing population of Muslims from South Eastern Europe, the Maghreb, and now the northern Middle East, one would think that Germans would recognise them as local by now. Yet, in spite of this, the reverse has happened. Muslims are increasingly spoken of as ‘foreigners’. How might we account for this? Segregation, of course, plays a role. Turks and Arabs have historically lived in lower income, predominantly immigrant areas, and government programmes encouraging their integration, in mainstream German society, has never been as successful as they should be. While responsibility for this situation may be shared, lower income brackets and inner-city ghettos aren’t exactly recipes for visibility in middle-class, suburban Germany. Then there is the east, home to both Petry and the grassroots social movement that helped build it, PEGIDA (Patriotic Europeans Against the Islamisation of Europe. Frequently derided for being monocultural and sympathetic to fascism, the caricature is not without foundation. The Communist DDR was not as pluralistic as the Federal Republic, and there were no comparable efforts at de-Nazification. Turks and Arabs today are subject to the same prejudices as Jews in pre-war Germany. Anxieties about the cultural consequences of unification, discrepancies in wealth between East and West – all of these factors play into the power that the AfD and PEGIDA are harnessing today, to try to make racism acceptable again in German politics. But they are not as geographically specific as they sound. The party’s ideology also resonates in the West, particularly amongst rightists who resent having to hide their hatred in the closet since World War Two, due to Germany’s strict laws on neo-Nazi propaganda. The best thing that could be done to to prevent a reformulation of Nazi anti-Semitism, is for Germans to reconcile themselves to the diverse country it has grown into, and recognise that it is here to stay. Not by issuing platitudes such as “Islam is a part of Germany,” but making it such, by ensuring that it as taboo to discriminate against Muslims as it is to discriminate against Jews. Though it took Hitler’s defeat to instill that in the country, making it safe for persons of other religions and cultures should not require the Bundesrepublik’s ruin to instill tolerance in the population. Regarding the seminal quotation: “Turks and Arabs today are subject to the same prejudices as Jews in pre-war Germany.” Joel Schalit has violated Godwin’s law or Godwin’s rule of Nazi analogies! JoeL Shalit owes a public apology!